I follow several Powell River friends online. One day there was mention of a book about horses, one of my favourite subjects. As a young girl in the suburbs of Los Angeles, I dreamed of having a horse of my own. My dad helped by taking me riding at a nearby stable on the Los Angeles River, which at the time was not the cement channel it is today. I always rode Flash, but I think his name was more of a joke than a description of his fleet footedness. When we came to Powell River, I saw a brochure offering trail rides at Tanglewood Farms. I’ve never completed my desire to check it out, but when I learned that the owner Phoebe Kingscote’s mother Barbara wrote a memoir of a riding adventure from the early 1950s, I had to get it. Barbara Kingscote grew up in Quebec in the 1940s. She too had a love of horses. Working on a small subsistence farm, she gained the experienced needed to apply for veterinary college. In 1949 when she was twenty years old, the owners of the farm moved to the West Coast, but couldn’t take their horse Zazy. The solution? Barbara would ride the black mare all the way from Montreal to their new home in Lytton, British Columbia. But just prior to departure, Charlie, the owner, gave the mare to Barbara to be her own. 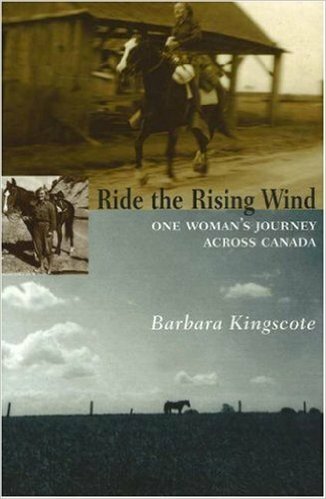 Ride the Rising Wind: One Woman’s Journey Across Canada (NeWest Press, 2006) is Barbara and Zazy’s story of the massive undertaking spanning sixteen months and over four thousand miles. Barbara left with minimal supplies lashed to Zazy’s saddle and $100 in her pocket. She stopped along the way at logging camps, farms and towns to intercept mail, buy meager supplies for herself and her horse, and enjoy the company of generous Canadians all along the way. When she wasn’t offered a loft or bedroom, the intrepid pair slept under the stars or a tarp in pouring rain. Their winter was spent working in the cookhouse at a logging camp. That was a story in itself. But come spring, the two were back on the road. To take such a journey today seems impossible. The roads are more like freeways, the traffic even more congested. Towns and logging camps along the way no longer depend on horses, so support would be minimal. That’s one reason Barbara’s story is so compelling. Horse people dream of such adventures and opportunities. The closest I ever came was riding in the Chilko Lake area helping a dude ranch hand with the horses.